I took this photo on our first day in Phnom Penh. Brian, Nicole, Araceli, and I were running off of about four hours of sleep, all of us were unable to get too much rest and met over breakfast. Little did we know at the time that we probably should have skipped the most important meal of the day. With our scheduled arrival in Cambodia being later Saturday night it was decided that the best time to take a cooking class was the very first day. Our hotel helped us direct our tuk tuk driver to the meeting point for the Linna Culinary School. Before instruction began our hostess, the illustrious Linna herself, took us on a tour of one of the small local markets. It was essentially a long crowded alley lined on either side with meat and produce. 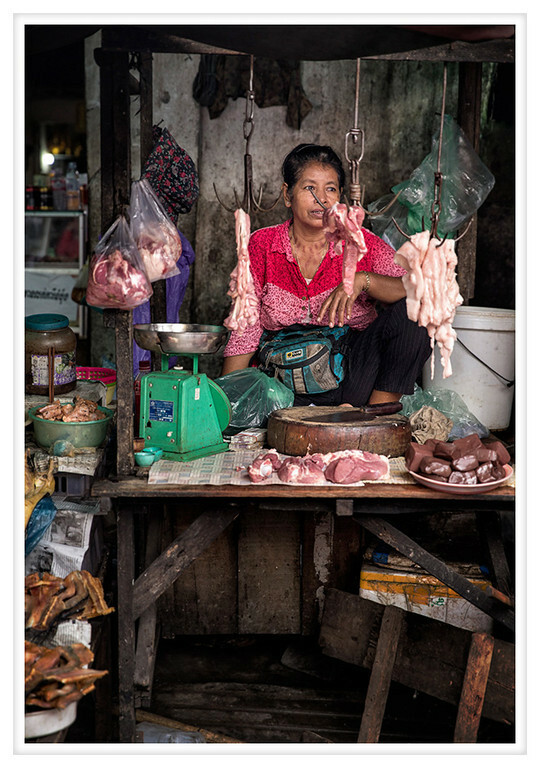 This particular woman caught my eye as she relaxed behind her cutting board and hanging meats. The wall behind had such great texture and her shirt provided such a nice contrast. I love markets, I think it is one of the best ways to people watch. Everyone goes to the market and only the wealthy manage to avoid it. There is such a great bustle of life, people chatting, haggling, and laughing. Little breakfast places interrupt the vendors and the crowds get thicker. Some of the smells are tantalizing and others put you off the idea of eating. Colors are bright and the sights and sounds are almost overwhelming but the excitement of the place is infectious. I never tire of markets and would happily go every day.